St Mary's has a dedicated and willing team of volunteers who give their time and talents to keep the church looking beautiful with fresh flowers at all times throughout the year. The flowers make an impact when entering the church and add a welcoming atmosphere which is important as part of our worship and praise. Special displays are always in place for the Christmas and Easter celebrations and particularly during the church's open season - May to the end of September. The Committee is grateful to members of the congregation who sponsor arrangements on many Sundays to remember a loved one or to celebrate a special memory. Our teams are also happy to plan and create flowers for other occasions such as weddings, funerals and concerts. 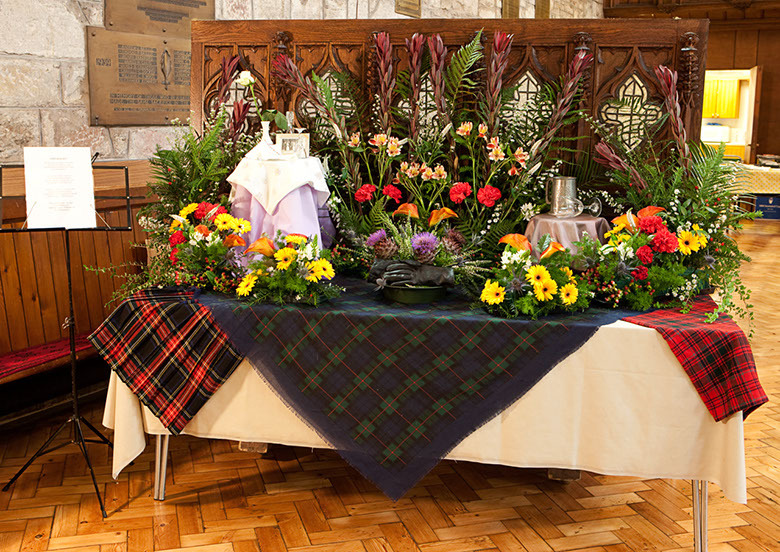 The image below is a display, entitled "Auld Lang Syne", from one of our flower festivals when the theme was Rabbie Burns.